With over 15 years in executive roles in hotel industry and experience across 3 continents, Ante has been privileged to lead exceptional development programs, directly manage hotel properties, and advise various notable hospitality companies. His expertise ranges from hotel property management, hotel development and its related agreements, to asset management, valuations, and divestment and acquisitions in hospitality industry. Ante has spearheaded numerous projects, strategic assignments and cross-border transactions across Europe, Russia, and now Asia. 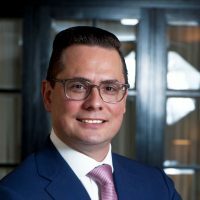 Following the career in the United States and ample experience in Europe and Russia, both as Senior Vice President of Netex Hospitality and Managing Director of Vestiga Consulting, Ante is presently appointed as Director of Development at Dusit Hotels & Resorts. Based at Dusit’s headquarters in Bangkok, Ante is heading the company’s global initiative to establish required corporate infrastructure and propel Dusit’s expansion through franchising and alternative asset-light growth models. With active growth in Asia, Middle East, Africa, Europe and North America, and with regional development offices in Bangkok, Dubai, Hong Kong, and Shanghai, Dusit International is today one of the fastest growing hotel companies in Southeast Asia. New concepts - what products really work for investors?